In the bowl of a 6-8 quart slow-cooker, combine chicken, ranch mix, Old El Paso™ taco seasoning, black beans, corn, green chilies and cream cheese. Give everything a little stir, cover and cook on Low for 6 hours or on High for 4 hours. Once the chicken is done cooking, shred meat and toss with sauce in the slow-cooker. Next, add the cilantro and serve the shredded chicken over warmed tortillas. To make this super spicy, try using Old El Paso™ Spicy Taco Seasoning. This is also delicious served with a side of rice! What’s better than a little Mexican food on a hot summer night? All you need are some cool margaritas, guacamole and a really great Mexican-inspired meal. Preferably one that’s quick and easy and won’t heat up your kitchen, am I right? That’s where the slow-cooker comes into play. I love, love, love using the slow-cooker in the kitchen during the summer months! It’s my favorite way to cook for a crowd without heating the kitchen up to a gazilion degrees—and with very little mess. 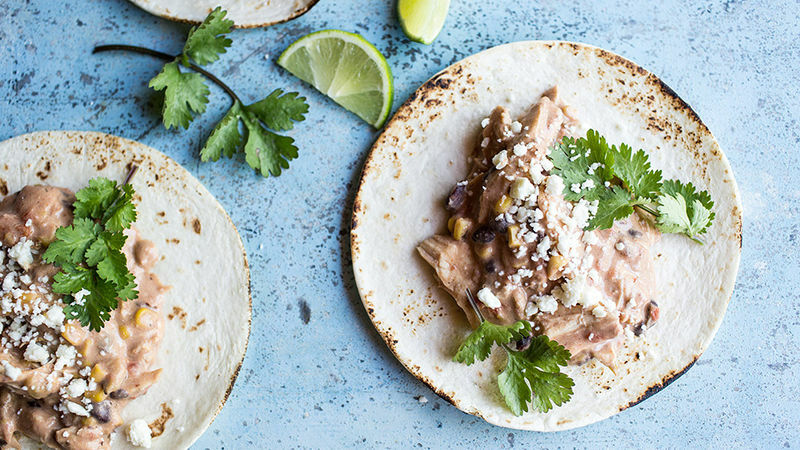 The creamy slow cooker chicken served in warm Old El Paso™ tortillas could not be easier or more delicious. You just need some simple pantry staples, a slow-cooker and a few hours to let the chicken cook to perfection. Once it’s done you’ve got the best creamy Mexican chicken around! No really, the best! All right, so grab your ingredients. In the bowl of a 6-8 quart slow-cooker, combine the chicken, ranch mix, Old El Paso™ Taco Seasoning, black beans, corn, green chilies and cream cheese. Give everything a little stir, cover and cook on Low for 6 hours or on High for 4. Once the chicken is done cooking, shred the meat and toss with the sauce in the slow-cooker. Add the cilantro. Serve the shredded chicken over warmed tortillas. Enjoy!